SAN FRANCISCO–I get quite a few chuckles from people who write about mental toughness when all they have to cite are statistics that come from other people’s experiences. Rare is the person who writes about how to be mentally strong from personal experience. When I interviewed to become an FBI agent, one of the things that the interviewing panel liked about me was that I was born and raised on a cattle ranch in the middle of Wyoming. I did not grow up pampered and did not see myself as entitled to anything. Instead, I was young, scrappy, and hungry to prove myself worthy of a chance to work hard and climb the ladder of success on my own. I did not have parents hovering over me to give me all the advantages that are making today’s kids soft, entitled, and ungrateful. Search the phrase mental toughness and you’re likely to come up with a muck-up of assorted opinions on what it means. Unless you know what makes you tick, you’ll be forever ignorant about the most important person in your life—yourself. FBI agents must know themselves well enough that they can predict their response when confronted with the unknown. Many believe that mental toughness is a leader’s ability to plow through emotions and feelings without being touched by them so they can continue to march stalwartly onward. It’s not that simple. FBI agents are successful investigators because they are able to recognize the negative emotions of others and anticipate how they could spin out of control. You can have the greatest ideas in the world, but if you can’t explain them to others, you will never be anything more than educated derelict. FBI agents use interviews as their most reliable and successful investigative tool. Despite what you see in movies and TV, communicating with people and getting them to cooperate is far more effective than extortion or threats. Resilient people are mentally tough because they take responsibility for their actions and do not resort to whining or blaming others for their situation. FBI agents are not able to choose their assignments so they learn to be resilient and bounce back from the sticky situations in which they often find themselves. The only time I got into trouble in undercover work as as an FBI agent was when I tried to be someone I am not. I could slap on a different name or title, but if I wanted to be successful I needed to be authentic about who I was. I learned this from years as an FBI investigator: It takes courage to tell the story of who you are with your whole heart. It’s hard to let go of who you think you ought to be in order to be who you really are. What makes your story unique also makes you powerful. The first thing I learned in the FBI Academy is that success would not make me confident; instead, confidence in myself and my abilities would make me successful. My four months at the academy were spent developing that confidence—before I was sent out with a gun and badge. Drop me in the middle of any squad or any situation, anywhere, anytime—I would not be scared because I was confident I would succeed wherever I was. Self-limiting beliefs are lies we tell ourselves because of something that has happened in our past. FBI agents learn early not to let the crap from their past bog them down; they know it’s not their past that defines who they are or where they are going in life. What truly defines them is their expectation of the future. The only difference between a rut and a coffin are the dimensions. The capacity to say “no” to the call of temptation and a desire to quit is called willpower. FBI agents need willpower to find the energy, motivation, and enthusiasm to keep going even when they are tired, anxious, and confronted with an investigation with no easy answers or solutions. Grit is your ability to persevere over the long-run and thrive despite all kinds of unplanned events. As an FBI agent, I knew that the way in which I dealt with challenges would determine how I would achieve success. Grit and perseverance, not talent or education, was the key to unlocking my greatest potential. Grit Up—Be. Fiercely. Awesome! Our greatest mental toughness tool is our ability to choose one thought over another. FBI agents are positive thinkers who believe they will prevail in their circumstances rather than believing their circumstances will change. A growth mindset believes that intelligence and personality can be developed; they are not immutably ingrained traits. The most successful FBI agents possessed a growth mindset that thrived on challenge and saw failure as a springboard for growth and stretching their existing abilities. Gratitude is one of the most important emotions we can cultivate because if we aren’t thankful for what we have, we will never be thankful for what we’re going to get. FBI agents, Navy SEALS and Special Forces cultivate the emotion of gratitude to help get them through tough times. The secret to success is simple: work hard. People who achieve success work hard to become top performers. FBI agents master skill sets by developing a flexible and agile mindset that can quickly change course if circumstances change. They know better than anyone that no one ever drowned in a pool of sweat. © 2016 LaRaeQuy. All rights reserved. 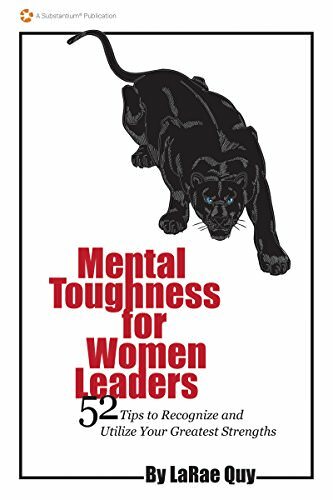 If you’d like to find out if you are mentally tough, get her FREE 45-Question Mental Toughness Assessment. You can follow LaRae Quy on Twitter, Facebook, AND LinkedIn.